Sonnet's Echo 11 is a thunderbolt 3 docking station with 87W of power delivery for compatible computers. Connect a wide range of computer peripherals such as USB, 4K monitors, ethernet, SD cards are more - all through a single thunderbolt 3 cable to your computer. Sonnet’s Echo 11 Thunderbolt 3 Dock connects your peripherals to your computer through a single cable. Simply plug in your devices—such as a printer, keyboard, mouse, cable modem, hard drive, optical drive, USB license dongle, headphones or powered speakers, phone, tablet, and (up to) two 4K displays—to the dock with their supplied cables, and then connect your computer with the included Thunderbolt 3 (40Gbps) cable. The Echo 11 dock even charges compatible computers through the same cable. When it's time to take your computer and go, just unplug the Thunderbolt cable to disconnect from everything at once. 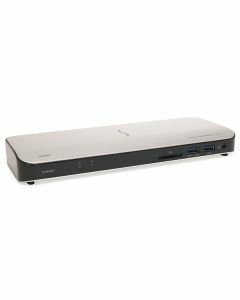 For users whose notebooks and laptops accept charging over Thunderbolt, the Echo 11 dock also provides up to 87W of Power Delivery through the included Thunderbolt 3 cable used to connect dock to computer. These computers fall into four power requirement categories: 30W (example: Dell XPS 12), 45W (example: Dell XPS 13), 60W (example: MacBook Pro 13-inch), and 87W (example: MacBook Pro 15-inch)—the Echo 11 charges them at the maximum power they will accept so you can leave your computer’s power adapter packed away! The Echo 11 Dock includes two Thunderbolt 3 ports; one for connection to your computer, the other to daisy chain up five additional Thunderbolt peripheral devices to your computer! The Echo 11 includes 10Gbps USB 3.1 Gen 2 support, meaning you can connect another USB device to the second Thunderbolt port using the proper cable or adapter. The Dock’s Thunderbolt 3 peripheral port can also provide up to 15 watts of bus power to devices requiring extra power for even the most demanding bus-powered USB 3.1 or Thunderbolt devices. The Echo 11 dock features an HDMI 2.0 port that supports a 4K @ 60Hz (or lower resolution) monitor. To connect an additional display, you can plug in a Thunderbolt 3 monitor to the dock’s second Thunderbolt 3 port or at the end of a Thunderbolt 3 device daisy chain. Or, you may connect other display types (HDMI, DisplayPort, etc.) by using a Thunderbolt 3 or USB-C video adapter (sold separately). With its eleven ports, the Echo 11 Thunderbolt 3 Dock is a handy hub to plug in your peripherals and connect them all to your computer through a single Thunderbolt 3 cable. Through that same cable, the Dock provides enough power (87W) to charge any compatible computer at maximum power. You can even connect two 4K @ 60Hz displays to expand your view and productivity. Computer Charging Port - Main Thunderbolt 3 port provides power to computers that accept charging over Thunderbolt 3, supporting them at the maximum power they will accept; leave your computer’s power adapter packed away! Wide Range of Second Display Connection Options - Select from a variety of inexpensive Thunderbolt 3 or USB-C to popular display interfaces such as HDMI, DVI, etc. Thunderbolt 3 Connection: LED indicator lights when computer connected to the dock is powered on, and turns off when the computer is sleeping or disconnected.